How Does Dehydration Affect Blood-Glucose Levels? Water is important for your health and staying well-hydrated may help you reduce your blood-glucose levels, which helps you better manage the hormone insulin. This is especially important for diabetics and some evidence suggests that proper hydration may help you from getting type 2 diabetes. Glucose is a form of sugar your body uses for energy. When you eat carbohydrates, your body converts carbohydrates to glucose. Foods that are absorbed more rapidly, such as refined sugar and white flour, result in a greater spike in blood glucose, whereas less-refined foods such as whole-grain bread result in a slower, steadier blood-glucose rise. As glucose levels increase, your body releases insulin, which prompts your cells to store glucose and reduces the amount in your bloodstream. Diabetes occurs when people become resistant to insulin, causing blood-glucose levels to remain high. If you're concerned about blood glucose, proper hydration should be a top priority. When you're dehydrated, your body produces a hormone called vasopressin, according to "The New York Times." Vasopressin causes your kidneys to retain water and also prompts your liver to produce blood sugar, which may lead to elevated blood-glucose levels. Over time, this effect may lead to insulin resistance, notes the "New York Times." Although more studies are needed to confirm this effect, dehydration may eventually lead to chronic hyperglycemia, or high blood glucose, which may indicate diabetes, according to a study published in "Diabetes Care" in 2011. The study followed 3,615 adults over nine years and found that those who drank the greatest amount of water were the least likely to develop hyperglycemia, while those who drank the least amount of water were the most likely to develop hyperglycemia. Along with possibly helping control your blood-glucose levels, staying hydrated helps your body distribute nutrients, eliminate waste and regulate body temperature. 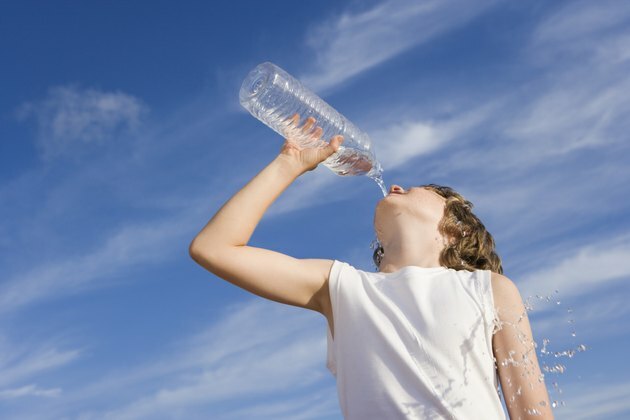 When dehydrated, you may lack energy, have trouble performing mental tasks and even experience low-blood pressure. To stay well-hydrated, most women should drink about 9 cups of water or other fluids per day and men should drink about 13 cups of fluids per day. Most beverages, including coffee, tea and milk, contribute to this total; sugary drinks such as juice and soda, however, may contribute to higher blood-glucose levels. What Are the 3 P's of Diabetes? Does Dry Red Wine Affect Glucose Levels?